Here's a list of recent podcast episodes from The Martial Arts Business Podcast with Mike Massie. Podcast Episode 38: How To Go From 50 to 150 Students With Small Dojo Big Profits! Podcast Episode 31: Are Cash Outs Good For Your School? 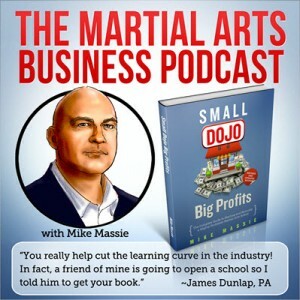 Martial Arts Business Podcast Episode 26: What Makes A McDojo? The Martial Arts Business Podcast Episode 2: Simplify!